Below are some common asked questions from our customers, if you do not see an answer to a particular question you may have, please do contact us and we will provide the answer. The minimum quantity you can order is 10. No set up charges or for repeat orders. Badge, crest image, or any requested images that are poor quality, may incur a small fee if this needs to be redrawn. Prices start at 4.00 each fully inclusive for large quantities. Once we receive your Contact Form details, we will email you our PDF price structure and information. If you supply a high resolution crest/badge file, we can offer you a free visual of your intended design. Multiple Text or Designs within one order? Yes, we can individually change the text or design on every item if need be. This is suitable for clubs who wish to personalise each item with a winners, runners up, or participating member and present to them. No charge for this service although more than 49 changes we may review this. 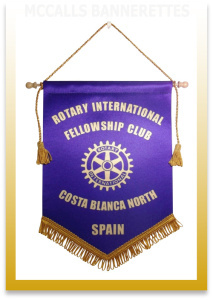 We custom manufacture our Banners and Pennants, so we have flexibility in what we offer. Standard sizes are Minis, A4, A3, and with many shapes on offer also, we are sure we can provide to your clubs requirements. We provide only one quality, this is the highest quality available, all our Banners and Pennants are made to the same high standard. This does not mean prices are high, on the contrary, because we specialise in Pennants, this means a like for like product we cannot be matched on value. Two Colour Fringe and Tassels? Yes we do! We are the only supplier in the UK offering 15 stock single colours and 6 stock 2 colour trimming. For larger quantities we can even custom make any 2 colour combination you require. How long will our order take to be made and delivered? We can produce your order quickly, our normal turnaround on an order is approx 10-14 days. We can fast track an order within 5-7 days depending upon your requirements. Each customer has different requirements, we will always evaluate each enquiry and offer the best price and delivery available. If you have supplied a high resolution file of your logo or design, we will produce a visual for approval or modifications. Once approved we then create an invoice for your order and then we manufacture your order and deliver your goods within the agreed timescale. We do not have a quality badge file image or design? This is not a problem at all. 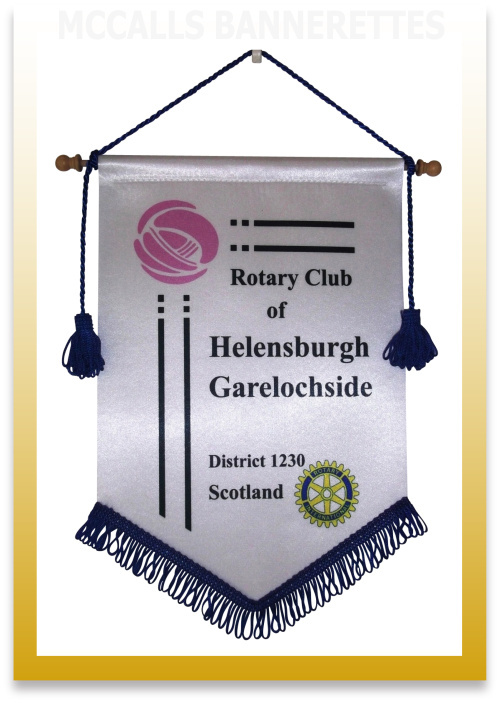 We can create a design from a poor quality badge image, or design your Pennants from scratch. We do not charge for design creation, but any images required which need to be professionally redrawn into high resolution, then a small design fee will be quoted. Custom made Rotary International Bannerettes. Custom made Rotary International Banners. 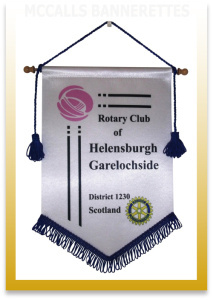 Supplying High Quality Rotary Club Banners and Bannerettes Worldwide.